The clean soft lines and pleats of Roman shades give an indulgent appearance without the heavy or bulky look which is sometimes created by the more traditional option of curtains. Roman blinds work by gathering panels of material vertical and horizontally with fabric cording. This means that when the blinds are pulled tight they will open allowing light into the room, but when dropped they provide excellent privacy and light exclusion. Shop Roman blinds at Blinds Direct and create your custom Roman blinds from a variety of colours and fabrics, today! Our beautiful range of Roman Shades to suit any window in your home. Roman blinds are still considered the most classic and elegant choice in window blinds. They consist of a piece of material that is pulled up into a pleated position when drawn upwards. Not only does this provide a classy aesthetic, but also a layered, textured, and luxurious feel that can’t be achieved with any other blind type. Roman blinds are one of the most customizable blinds that you will ever come across. Blinds Direct offers you a wide range of colours and fabrics to choose from. This choice in fabric also alters the price, meaning that you can easily work within a set budget. The thickness and quality of the materials that you select for your roman blinds will play a large role in how well they manage light and heat. Thicker materials will expel heat and light in the summer, and retain it well in winter. Did you know that roman blinds weren’t actually invented by the Romans?! They were designed, and then widely used in the Mediterranean for a number of years. 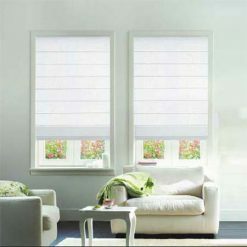 In fact, you will find that roman blinds are still the traditional choice of blinds in many Mediterranean homes today. It was, however, the Romans that made these blinds so popular. Their love and adoration is what sparked worldwide interest in it. When they were embraced by the Victorians, they spread among the western world as a décor fashion. Feel free to contact Blinds Direct should you feel overwhelmed by the material. We will assist you in selecting the perfect material to suit your budget, décor style, and light and heat management needs. Use roman Blinds as a window dressing option around your entire home or office, or use them to cover any glass areas such as doors and enclosed patios and entertainment areas. They’re so simple to use making them great in any environment. The best feature is the fact that they are timelessly elegant. You never have to worry that your Roman blinds will go out of fashion, or won’t stand up to the latest décor trends. Rest assured that Roman blinds are a much-loved classic that will always attract the right attention.